This GPX file contains the route I used to cycle from The Lexicon in Bracknell to Windsor Castle on May, 7th 2018. It goes via Ascot passing by the Royal Ascot Race course and through portions of Windsor Great Park. I left home today with the intention of recording a bike Vlog to talk about my Via Francigena project, but I decided not to. Wasn’t really in the mood for talking today, but I thought would be nice to post some moments of the ride to Windsor. When I arrived in Windsor there was a Salvation Army parade coming in the other direction and I thought that could be interesting to show you. 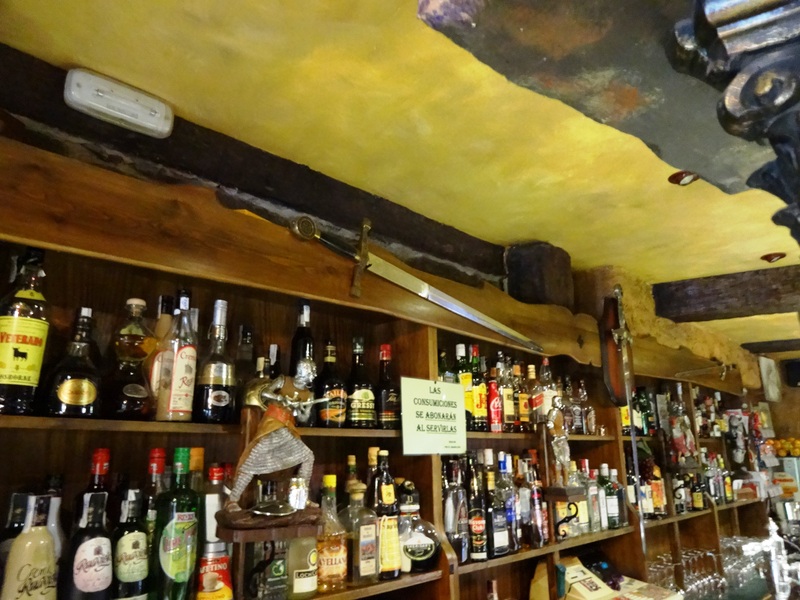 If there is such a thing as a “5-Star” Pilgrim’s hostel, this must be it. 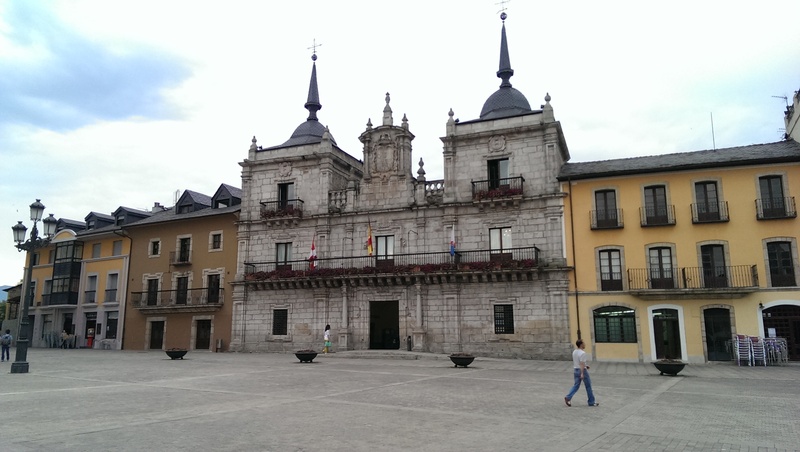 Welcome to the DAY 11 post of our Camino de Santiago Pilgrimage by bike which happened on the 4th of June 2015. We did this stage of 61.89 Km or 38.5 miles from El Acebo de San Miguel to Las Herrerías in 6h and 12 min, of which 3h 58 min were of actual moving time. 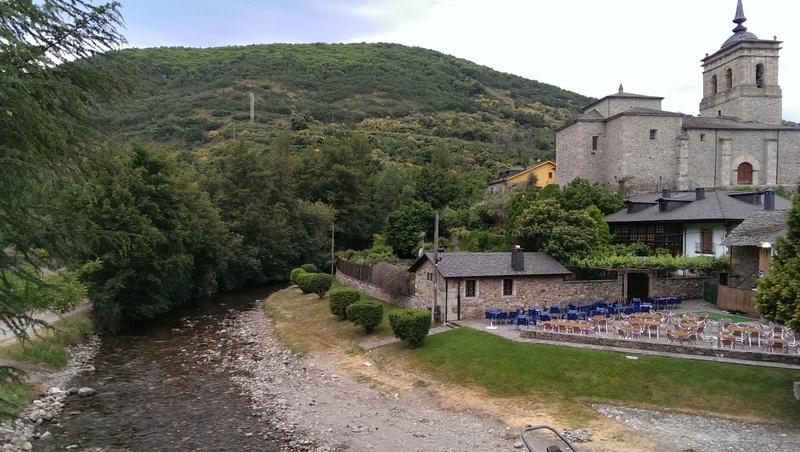 Picture taken from the old stone bridge over the Meruelo river in Molinaseca. I left the 5-Star hostel “La casa del peregrino” about 8 in the morning as usual, and as usual Fernando had already left by then. El Acebo is located at an altitude of 1,130m according to my Garmin and in a period of just 15 min I went down nearly 500 m and covered more than 10 Km distance. The only thing preventing me to go faster was the tight curves and turns of the road, which nearly tricked me once and forced me to go over the opposite lane due to the speed I was riding. Thankfully there was no incoming traffic, or that could have been a problem. In Molinaseca the altitude evened out and remain more or less constant through the ride this day. I crossed through the village of Molinaseca, but not before taking a couple of pictures from the old stone bridge over the Meruelo river, built in Ancient Rome times. 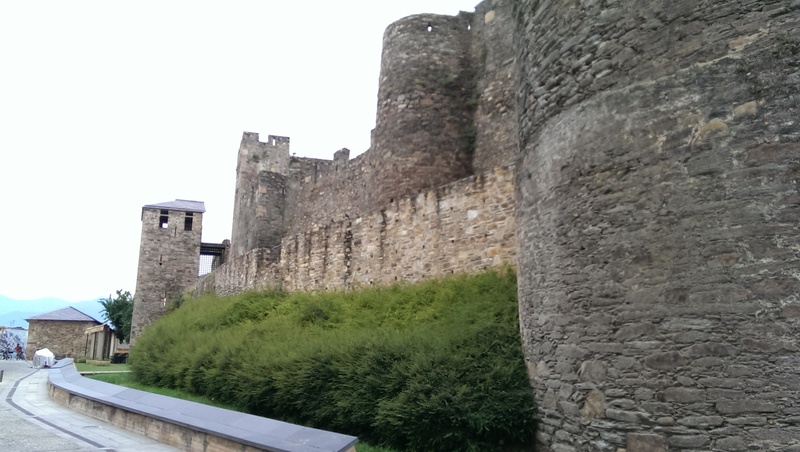 Next was the town of Ponferrada. As I arrived in the town centre I found Fernando taking pictures. 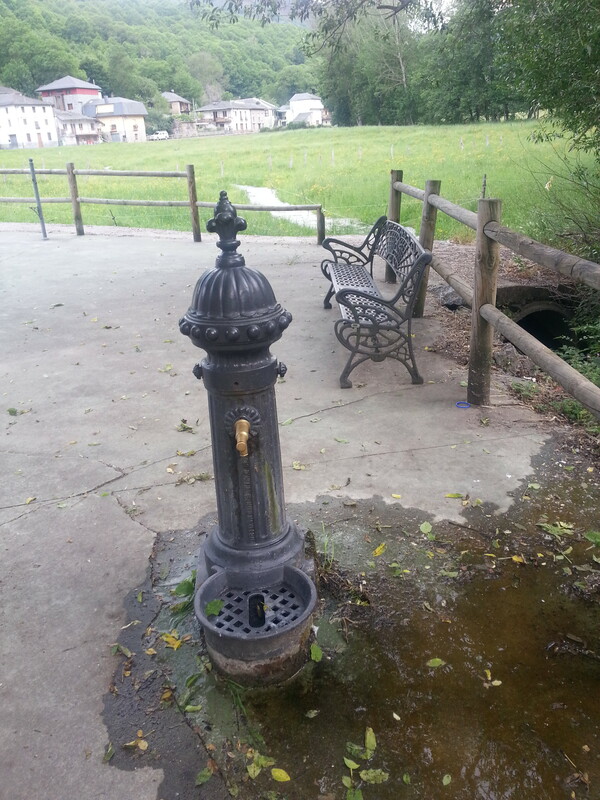 This town has that wonderful mix of new and old and would be worth staying for a couple of days, if you can afford it. 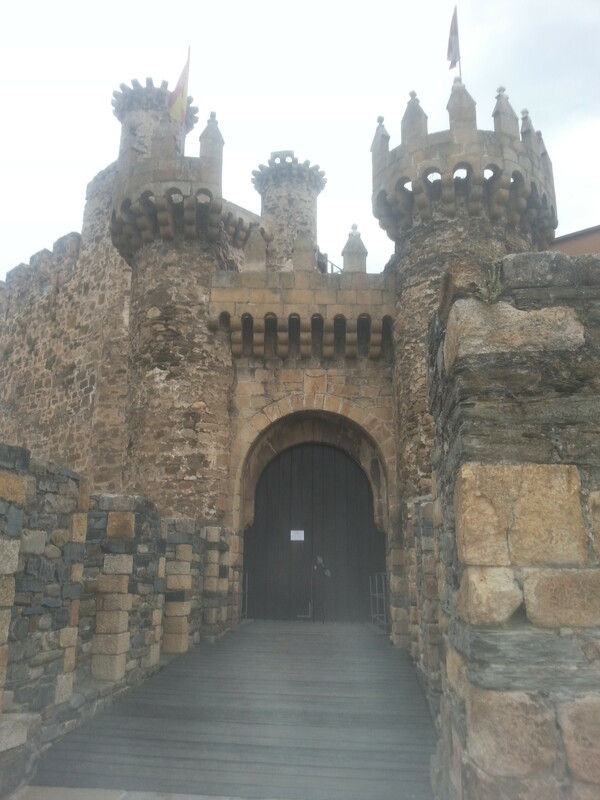 I believe one of the main attractions is the Templars‘ Castle known as the “Castillo de los Templarios”. It’s is a well preserved and impressive middle-age edification and has all the characteristics you would expect of a middle age castle. Fernando and I made a Breakfast stop in one of the restaurants facing the Castle. 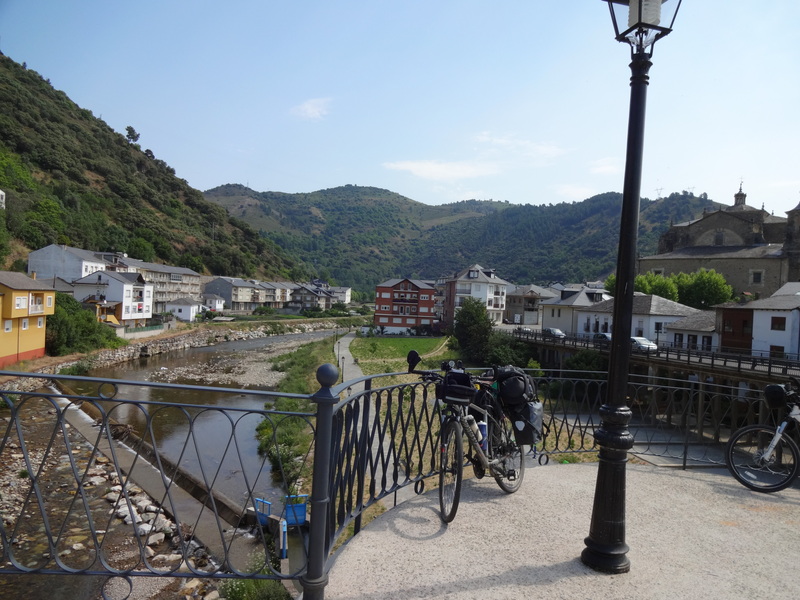 After Ponferrada we rode through small towns and villages such as Camponaraya, Cacabelos, Pieros and Villafranca del Bierzo where we stopped for about 15 min for a rest and something to eat and drink. Villafranca Castle. 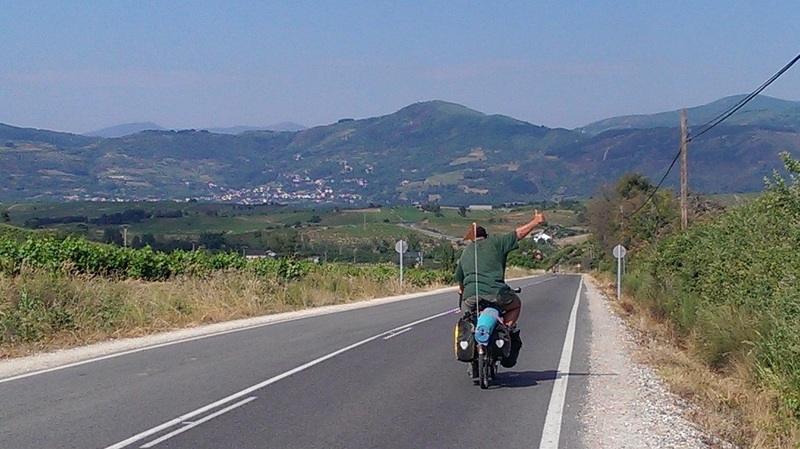 Michael, one of our “Camino” friends can be seen riding his bicicle in this picture. Villafranca de Bierzo is an old medieval town with very interesting architecture, such as the Villafranca Castle, the church of San Juan and other religious buildings such as the Collegiate of St. Maria and the convents as well as the narrow bridge over the river Burbia overlooking the town. Picture taken from the narrow bridge over the river Burbia. The route then follows the “snake” like path of the N-VI road alongside the magnificent A-6 motorway (Autovia del Noroeste) crossing under it several times. With its many tunnels and high valley bridges, whose pillars can be seen from bellow, the motorway offers an interesting and modern perspective to the views on the road (N-VI). 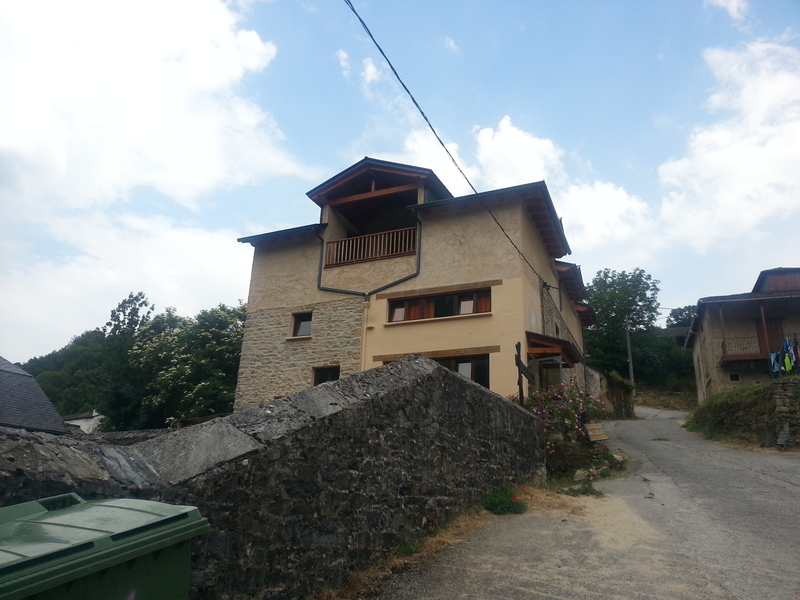 Mix of old and new in Vega de Valcarce. 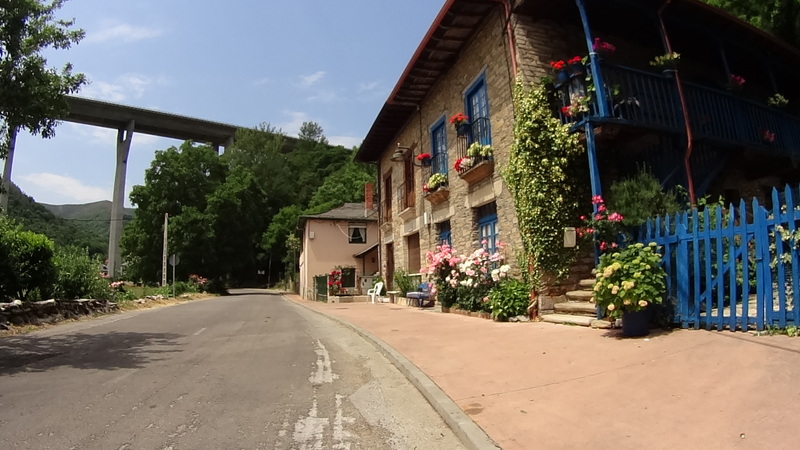 This road also follows the path of the small Valcarce river which lends its name to some of the towns and villages along the way. As I was pedalling on the shared pedestrian / cycle path, protected from the cars by a concrete wall, I kept looking at small river below and all the green around it and thinking that the people who travel at 70 – 80 mpg on the motorway above will never know the natural beauty that was just below them. This is something you can only experience in slow forms of transportation such as cycling or if you are walking. 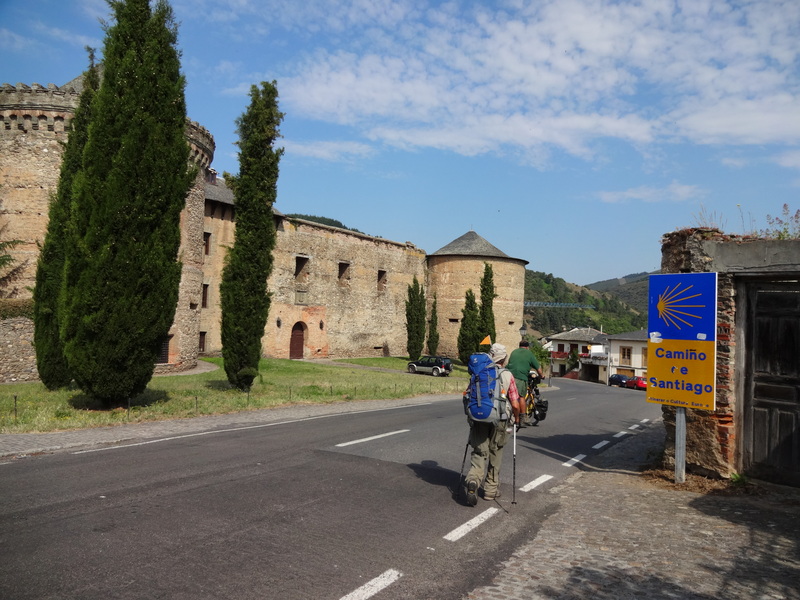 Along this route we crossed through the villages or towns of Pereje, Trabadelo, La Portela de Valcarce, Ambasmestas, Vega de Valcarce, Ruitelán until we finally decided to call it the day in Las Herreíras. 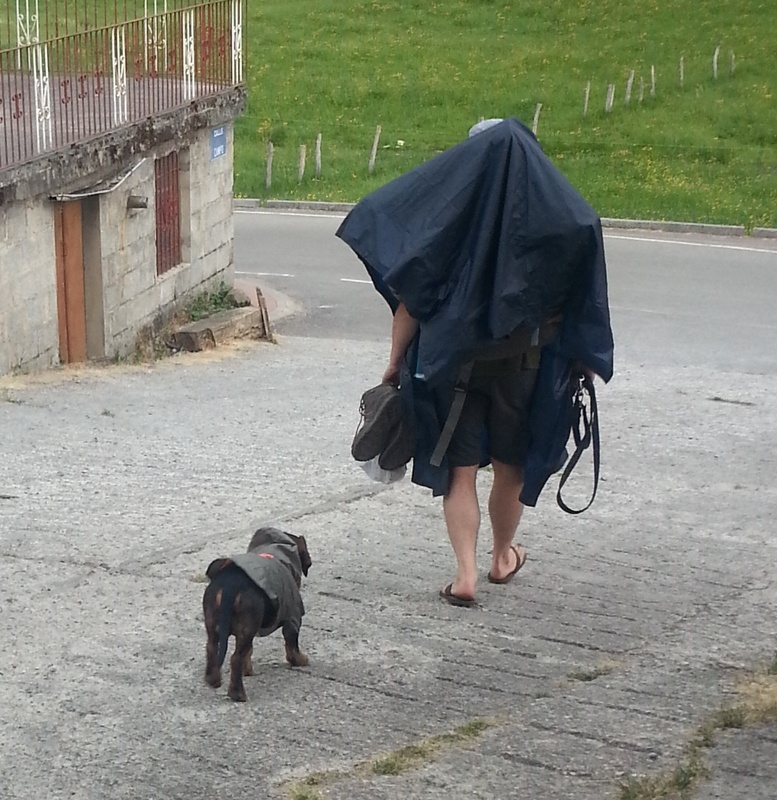 Las Herreiras is a tiny village just before the El Cebreiro mountain which is known as one of the greatest challenges of the Camino and we could see a storm approaching in the horizon, so it made sense to stay there. 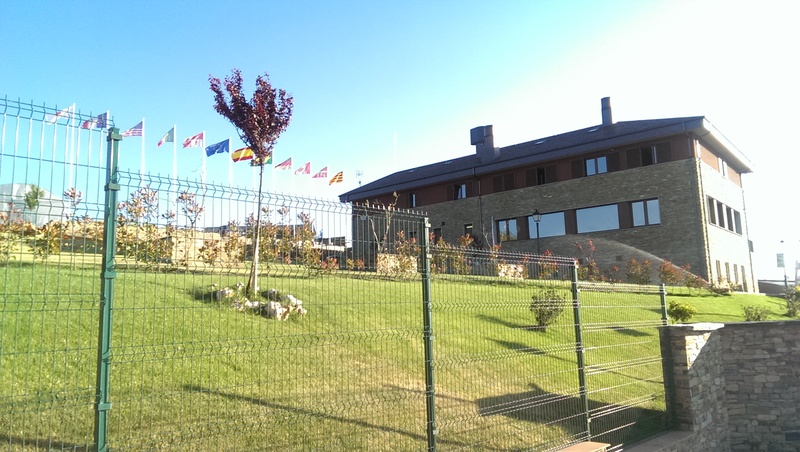 To my knowledge there is only 1 Pilgrim’s hostel in Las Herreíras, appropriately called “Albergue Las Herreíras“. The hostel was 8€ for the night and is run by a nice lady who speaks many languages (I’ve overheard she talking in Spanish, German, English and French) who is a strict vegetarian. She offers evening meals, but no meat. She cooks the meal herself and there is no menu to choose from. I believe she charged us 12€ and it had soup, some type of salad as main meal and carrot cake as desert. It was enough and delicious even for a meat eater. Other than that there is only 1 other place in the village where you can get something to eat. There are essentially only 2 rooms. The upper floor has the main room with about 10 bunkbeds and a small individual room for 2 pilgrims or a couple which costs a bit more (12€, I believe). Downstairs there is a small reception and the common areas with two bathrooms / toilets, a laundry area with a washer / drier and the dining room with 1 big and 1 small table. 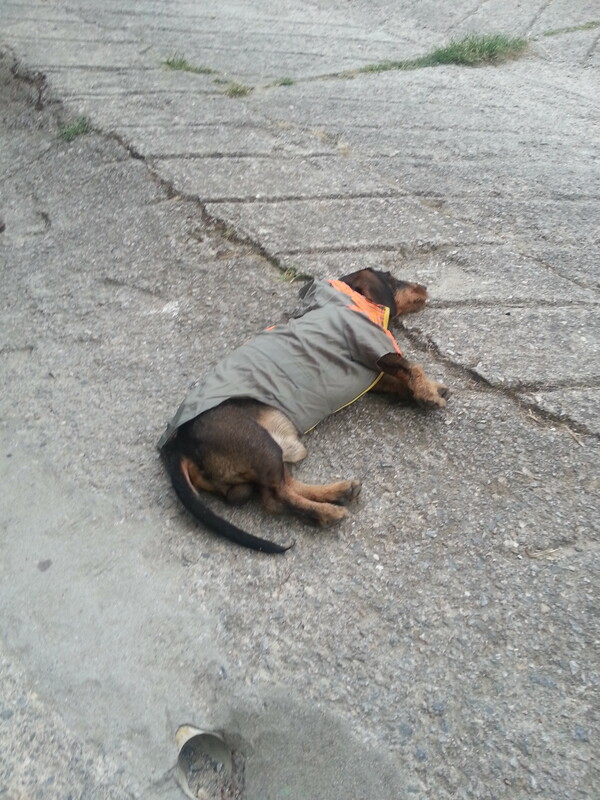 Willy is an 8 year old daschund pilgrim. 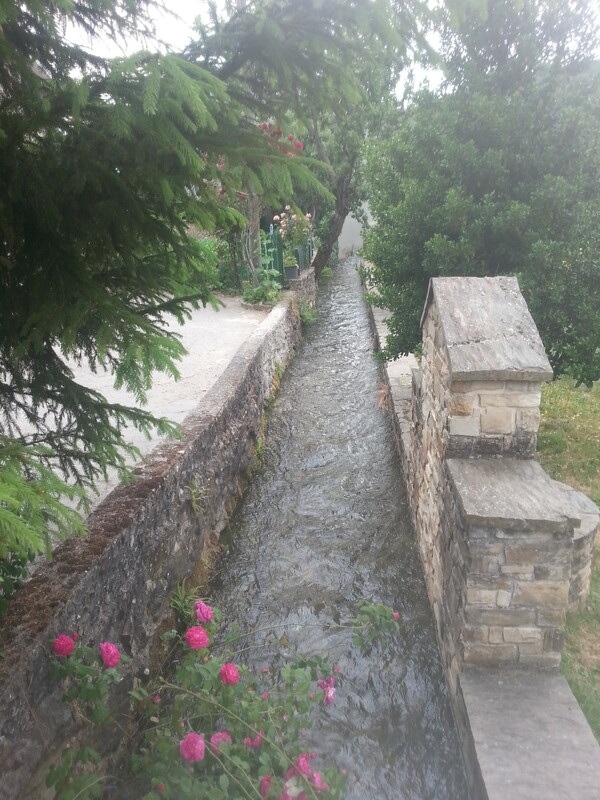 After having a shower and handwashing a few pieces of clothes I had a walk through the village and took a few pictures of the small “Las Ramas” river by the village. Moments later the storm came and a flash of lighting appeared to have been the cause of the complete power blackout in the village for more than 1 hour. The time was spent talking to other pilgrims from various parts of the world and playing cards. 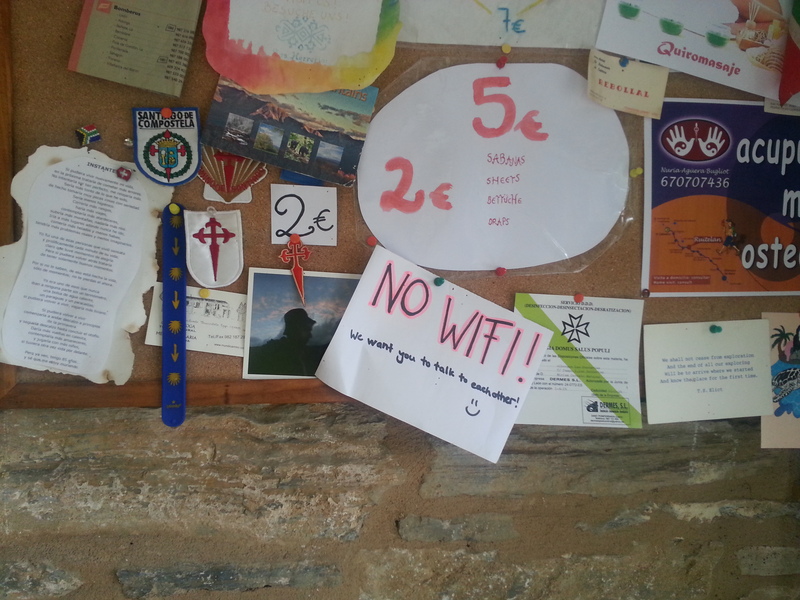 No Wi-FI in the Albergue. “We want you to talk to each other”. That’s it for day 11 of the Pilgrimage. Please feel free to leave comments, questions or at least indicate if you liked it or not by clicking on the stars in the bottom of the post. Decided to try something new… This is my first, and possibly last, attempt to create something people have called a “Bike VLog“. I´ve been watching a few over the past weeks. They are generally edited “best moments” of someone riding a bicycle to work or for pleasure. My choice was to record my ride to Windsor yesterday, something I do quite often. I thought of recording this ride especially for the people who don´t live in the UK, as Windsor Castle is a major tourist destination here. The problem is that it took me more than 1 hour to get there (I usually to do it in 40 to 45 min) and I don´t have the time (nor the will) to spend hours editing it. If you ever wanted to know how it is to ride in England, this long video might offer some insights. In all Bike VLogs I´ve seen the riders usually narrate the ride and talk about their day and their lives. They share a bit of their lives with the audience and it is kind of interesting. So this is what I tried to do… keep talking. That is not a problem for me (I am a big talker), but as I ride alone most of the time, this was quite unusual. Not sure how interesting it will be for you to listen to my “bla bla bla” for 1h, but I am not here to judge myself. I am sure there will be plenty of people out there doing this for me already. Please be kind, I am taking myself out of my comfort zone here. OK, let´s get on with this then… I recorded the ride from the South Hill Park, a landmark of Bracknell to Windsor Castle, a landmark of Windsor. I also recorded a little 10 min walk I did around the Windsor Town Centre for those that might be interested of knowing a bit about this tourist destination and then a recorded my way back to Bracknell, which was even longer as I amazingly managed to get lost a few times. Not used to do all this talking while riding and I got distracted and missed a few turns. This was the route I took… I was not in a hurry and there are faster routes to Windsor. Ten minutes walk pushing my bike around the pedestrian zone of Windsor. This was the way back from Windsor to Bracknell, via Legoland. Got distracted with all the talking and missed a few turns which took me to some places in town I wasn´t very familiar with, but I was happy for the mistakes as it gave me the opportunity to explore a bit. Bike: Specialized Crosstrail Disc, converted for touring.